Whether there are 40 students or 5 in a classroom, there are always differences in how kids learn and what they need in order to be successful. The longer you work with children, the more tools you’ll have in your toolbox and you might think you’ve got it all figured out, until the day that you don’t. Students’ needs vary widely and what works for one year’s class might not work for another; what has worked for the 150 students you’ve taught over the last 7 years might not work for the new student who arrived last week. 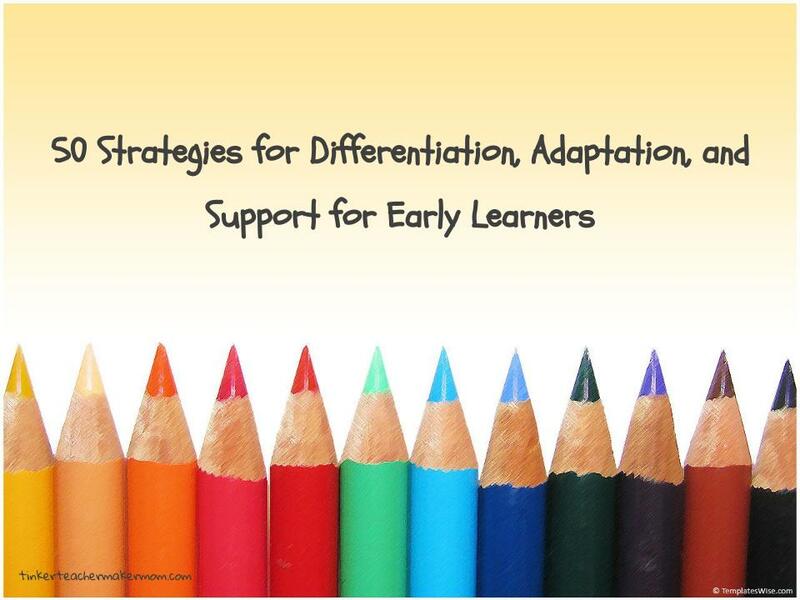 To help you build your toolbox, here are 50 strategies for differentiation, adaptation, and support for early learners. Give student a job to help maintain focus. Include predicatable songs and movements that reinforce concepts and appeal to multiple learning styles. Provide alternative seating options such as beanbag chairs, cube chairs, cushions, etc. Preview questions so the student has answers in mind when called on. Have the class “whisper to their thumb” the answer to questions before calling on the student as a model for language. Give the student a chance to be an “expert” on something they know/do well, such as a topic of interest. Repeat/restate the student’s responses to provide validation and model language. Scaffold questions to meet individual student needs. Provide an individual calendar with moveable pieces for student to manipulate. If another adult is present, provide close proximity to quietly redirect focus by repeating important information and restating questions. Use sign-language or pre-arranged signals for non-verbal re-direction or repetition of directions, such as sit down, stand up, listen, look, and stop. Use the Premack Principle and First/Then language or visual. Use timers, visual timer, or Stop Light visual to give student information about how long they have to attend to the task. Provide within stimulus prompts to call attention to key words/letters (make them larger, a bright color, say them louder as you read, etc.). Use behavior momentum by having the student find something they have mastered (the first letter of their name) 2-3 times before asking them to find something that may be harder (the letter of the week). Recast student response to questions to model correct grammar/vocabulary and build expressive language. Use objects, materials to demonstrate story events. Front loading—pre-teach/share the story, vocabulary, or strategy so the student can act as a leader during the lesson. Work with student using a modified book. Proximity control– seat student near teacher to allow for immediate feedback. Use brightly colored/attention-grabbing pointers to bring attention to target words/letters/ideas. Use highlighter tape to provide within stimulus prompts to call attention to key words/letters/ideas. Provide movement breaks and purposeful movement that reinforces key concepts for kinesthetic learners. Use gestures and visual cues that relate to given activity to help student recognize routines. Double plan—students always have a cognitive task while teacher is instructing or peer is taking a turn (increase active engagement by having students sky write letters, tap out sounds, whisper to their thumb, etc.). Chunk directions and information into smaller, more manageable pieces. Use various modalities in teaching—kinesthetic, visual, auditory, technology, etc. Use Progressive Time Delay as an error-minimizing strategy. Use successive approximations strategy to positively reinforce increasing accuracy. Prepare Task Analysis Cards/Process Chart for work stations that break the activity into smaller chunks. Utilize flexible grouping of students based on data to give students opportunities to peer tutor and work collaboratively. Allow student to repeat activity frequently to build confidence, act as “expert”, and allow for multiple exposures to content material. Develop clear routines and procedures for transitioning. Use selective ignoring for small undesirable behaviors (behaviors that are annoying, but not harmful). Ignore the behavior, not the child. Provide a starter statement to scaffold language. Utilize turn-and-talks so students have time to process thoughts before sharing out. Provide increased wait time for student to answer questions. Provide Personal Office to minimize distractions while working and provide theme-based vocabulary, sight words, letter formation models. Allow use of various writing utensils. Provide sensory materials and manipulatives for writing (sand tray, shaving cream, magnetic letters, etc.). Write the word in highlighter and have the student trace. Provide extra time for student to write word. Provide manipulatives and multi-sensory materials. Allow student to model with you as you demonstrate a new task/activity to the class. This can serve as a “rehearsal”. Provide sensory manipulatives—play dough, lotion, paper to crunch/cut, etc. Provide quiet music with headphones. Designate a quiet area with controlled choices for activities. Time invested upfront is time saved down the road. It might take an hour to make a process chart or First-Then Board, but think about how much time and energy you’ll save tomorrow, next week, and for the rest of the year. Give the strategy (and yourself, your student, and others) time. It can take a few weeks for new strategies to take hold. And sometimes, honestly, things get worse before they get better. But if a strategy is not working during the first few days, that is okay (it’s even to be expected). Breathe and give it time. If it isn’t working after a few weeks, reflect on why. Do you need to modify what you’ve got or scrap it and try something totally different? Be intentional. Don’t try to have a strategy for every kid at every time of the day. Are there strategies that will work for many kids, even if they don’t need a support it likely won’t hurt if it’s in place for the whole group. Figure out where the fires are, what’s causing them, and if there’s a pattern to the conflagration (If you are addressing a behavioral goal, here is my favorite ABC Checklist Printable PDF). The most important part of being intentional is being consistent. Especially at the beginning, you have to use the strategy you’ve chosen every time the behavior or goal that you’re targeting occurs. Certified Early Childhood, Elementary, and Special Education K-12 teacher in MD & WA. Former curriculum writer and professional developer. Mom of a 6 year old. Reading this sure makes me appreciate the students we work with. Every students has different needs, which is why they should explore as many options for college as possible! Teachers really have the hardest jobs out there and figuring out how to best teach each student is a new challenge every week.